Hearing The Derek Trucks Band was recorded in 1996, when the leader was all of seventeen, you mightn't be expecting something this impressive but Derek had, by that time, been playing professionally and semi-professionally for six years. He'd had bassist Todd Smallie on board since '94, drummer Yonrico Scott since '95 and singer/keyboards player Bill McKay had been around for a while as well, so we're talking a debut recording by a seasoned outfit, regardless of the leader's relative youth. Recorded around a year before the album's release in October 1997 the album certainly isn't lacking as far as aspiration is concerned. Out of a dozen tracks, eight might be original compositions but there are also a couple of fairly ambitious covers in the form of John Coltrane's Mr. P.C. and Naima, Miles Davis' So What and Wayne Shorter's Footprints. Thirty-five seconds of Sarod (Trucks playing the Indian instrument) leads straight into a blistering, turn on a pin reading of Mr. P.C. that’ll be familiar territory to anyone familiar with Derek’s later work. Suffice it to say he had his chops more or less down back this far and has spent the intervening period honing and polishing. Gary Gazaway contributes a horn part to 555 Lake that punctuates a warm vocal (in fact the album’s only vocal) from Bill McKay and there’s some fine ensemble playing on D Minor Blues and #6 Dance. Things get ambitious with the covers of Footprints, Naima and So What with the group composition Out of Madness (Scott/Smallie/Trucks) thrown in between the first two to break things up and, impressively those ambitious covers come across as pretty much of a piece with what had preceded them, as well as the Evil Clown and Egg 15 that follow. Forty-one seconds of Sarod Outro brings a rather remarkable debut to a close. 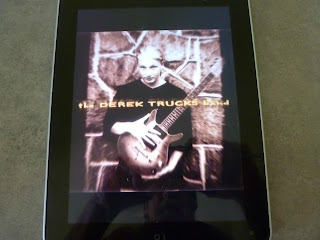 Whether or not Derek Trucks is (as has been hypothesised by, among others Gregg Allman) the reincarnation of Duane Allman there’s no doubt he was, right from the very earliest stages of his career, ploughing a row very similar to the one Duane might well have chosen himself, aided by a flawless rhythm section capable of turn on a pinhead precision. Given the time lapse since the album came out, and given exposure to subsequent work, your jaw mightn’t drop quite as far as it would have if you’d heard this back in the day, but it’s a classic recording that’s thoroughly worth investigating.